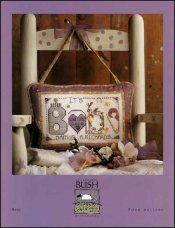 Baby [C7041] - $4.00 : Yarn Tree, Your wholesale source for cross stitch supplies. Quick, one page chart. Clever and easy baby sampler with room along the bottom for baby's name and birthday fits in the small heart in the letter A. Suitable for a boy or girl. 70w x 40h.